The following memory is from a letter that I received from the great film/television actor Peter Falk. Falk appeared with Pleasence in the COLUMBO episode Any Old Port in a Storm, which he considers among the top five in the television film series. Very special thanks to Mr. Falk for taking time to pay tribute to the "Man with the Hypnotic Eye." 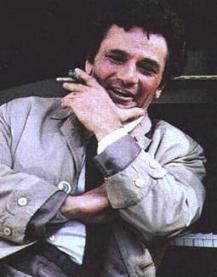 Visit THE ULTIMATE COLUMBO SITE ! "A joyous experience with a brilliant actor--working with Pleasence--that's Heaven! One of my all-time favorite guest stars. Playing a murderer, his spontaneous child-like glee at Columbo's ability to identify a particular Cabernet--that moment is burned into my memory."